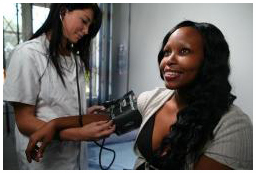 Medical Aid Fees charged are within the prescribed medical aid rates however the clinic is not contracted into medical aid; thus patients are required to settle their bill and then claim back from medical aid. What can a homoeopathic practitioner treat? A registered homoeopathic doctor is able to treat a very wide range of health problems, from minor acute conditions like colds and flu to chronic diseases like arthritis and eczema. Most of the common conditions which are treated by general practitioners can be treated by homoeopathic doctors with the exception of conditions requiring surgery.The major difference between a general medical practitioner and a homoeopathic practitioner is the type of medicine prescribed; as opposed to orthodox medicines, homoeopathic practitioners prescribe only homoeopathic medicines (natural remedies made from plant, mineral or animal sources). 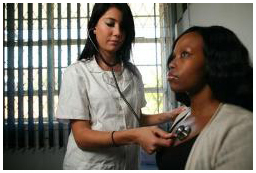 What does a homoeopathic consultation at DUT involve? A 5th year homoeopathic student in their final year of academic studies will consult with you under the supervision of an experienced, fully qualified homoeopathic practitioner. They will begin by taking a detailed medical case history surrounding your complaint and will then discuss with you, all of the relevant treatment options that are available for you. This takes approximately 45-60 minutes to complete. Following this, a thorough physical examination – including blood pressure readings, height and weight, breathing, heart and abdomen and any other areas which you may be experiencing health problems will be assessed.Once the examination is complete, the homoeopathic student will then select the most appropriate homoeopathic medicine for you under the guidance of the qualified homoeopathic doctor, and, if necessary, request additional tests such as blood tests, x-rays etc. Your prescribed medicine will then be dispensed from our on-campus clinic dispensary and you will be carefully instructed on how to administer the medicine during your treatment. Patients are also usually advised to come back for a check-up about three weeks later depending on their particular health problem and needs. In some cases, this follow up period may vary. All follow up appointments are shortened in duration and take about 30 minutes to complete.